Before deep-diving into the question, What is Business Partnering?, let’s establish that the definition “partner” in the role titled HR Business Partner, Finance Business Partner or IT Business Partner does not change according to that function. 2,000+ Business Partners across the globe have participated in our Business Partnering Programmes and told us what worked (and what didn’t) when they applied their new skill-sets back in the business. What was interesting for us is that: no matter their function (HR, IT, Finance etc. ), they told us the same things worked over and over. As a result, we have refined our definition of Business Partnering to be function agnostic and according to what has worked in practice over and above what is posited in theory by David Ulrich1.Ulrich, 2001. Human Resource Champions. Business Partners are members of a function e.g. Finance, IT, HR, Legal, External Relations, who act as a connector, a bridge, linking functions and business units (at different levels sometimes including sometimes at C-suite level) to ensure that the technical expertise they have to offer is placed within the real and current concerns of the business to create value. These individuals have the potential to greatly improve integration within the organisation. They maximise the timely deployment of the functions’ skills and expertise within a shared understanding of business priorities. At any point in time, a business partner will be called upon to act in one of several roles. We have developed our framework identifying 4 distinct roles Business Value Creator, Policy Implementer, Technical Specialist, Functional Intermediator (see Figure 1 below). Business Partnering therefore, requires a high degree of relational mastery and business acumen, to sit alongside technical expertise and experience. 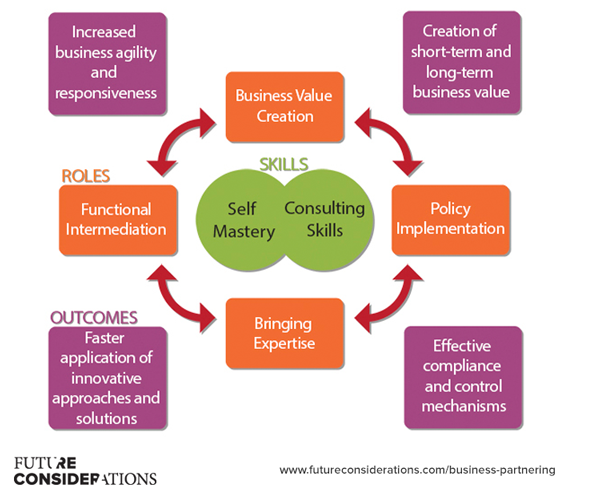 We have found that a focus on general consulting skills is an effective lens for business partners as they are often acting in the capacity of a consultant to their business unit(s). Masterful Business Partners also have independence of thought and action even under pressure, what we call Self-mastery, but always in service of the wider system. What do businesses have to gain from effective Business Partners? Increased business agility and responsiveness. React faster to a new demand from their business arising from a competitor offer with a timely response that could significantly reduce any competitive advantage they might have gained. Faster application of innovative approaches and solutions. Shorten the length of new product development (NPD) cycles or reduce costs through process efficiency. Effective compliance and control mechanisms. Improved product and service quality leading to higher reliability and thus increased perceived value and customer loyalty. How can you become an effective business partner? Take a minute. Think about the Business Partners that you have work(ed) with. Have you ever partnered with someone who you have found to be particularly authentic and influential, without any sense of being manipulative or acting solely on their own agenda? These affable people are able to relate to you in a deeper and more generative way. What’s more important is that these relational skills can be learned and become embedded in your practiced over time. Why is this important? Because they are powerful levers to establish and sustain deep and true partnership. As I said earlier in our answer to What is Business Partnering?, it is important to recognise that the role of a Business Partner is multi-faceted. That means that while you may be naturally relatable, you must also consider and skilfully select the most appropriate role(s) in an instant and have the presence of mind to switch as and when the situation changes (perhaps more challenging than it sounds). N.B. When it comes to Learning and Development, we know that “one size doesn’t fit all”, which is why when we talk about our Business Partnering framework, it’s important to remember that we are talking about a skeleton that is fleshed out during the analysis and design phases of any new client relationship, not an off-the-shelf / turnkey programme but a customised programme designed to achieve specific objectives and overcome identified challenges. Business Value Creator – I have a deep insight and am “savvy” around how the organisation makes money and creates value. My contribution contributes to the bottom line for the short and long term rather than detracting from it. Policy Implementer – My ability to bring about compliance to functional policy in an effective way builds commitment rather than resistance from the business and drives sustainable and ethical results beyond blind adherence to process. Technical Specialist – I have more than a core functional expertise and continually strive to deepen my specialism and leverage it in service of business outcomes. Functional Intermediator – I have a large and relevant network within my function, in other functions, in the business and among suppliers to support delivery of richer solutions to the business’ needs and I both use the network directly and broker relationships that help others. Click here if these four roles are something you would like to learn more about. Participant story 1: A corporate lawyer learned to “listen” to what is going on in her body while in the middle of high stakes situations (corporate merger, multi-billion USD deal discussions, advising the CEO). By getting out of her head and into her body, she was able to shift her mind, stay centred (physically and mentally) and really get into the game. She reported being able to be more effective in the conversation and to feel more fully resourced during the process. Participant story 2: An IT Business Partner was able to increase the commitment of their users by being able to demonstrate that they really “got” their business issues and opportunities by speaking their language rather than “IT-speak”. In doing so he also found that he could see more likely opportunities to use his IT expertise and that of his colleagues to more readily support business driven initiatives rather than be seen as pushing the latest IT trend. In short, this refers to your ability to maintain independence of thought and action for the sake of a better business outcome. The challenge is being able to hold your personal / functional line while understanding and interpreting all information objectively, and saying “No”, when appropriate, “Yes and “ sometimes and “Yes” when alignment is reached. The shift in being able to have difficult or confronting conversations internally produces a higher level of respect, mutual understanding and thus builds trust, an essential element of any effective relationship. Participant story 3: A Finance Business Partner shifted his perspective on building relationships from doing only what was asked of him (i.e. being essentially an order taker) to a role of functional leadership within the business. By doing so he was able to establish much greater credibility with business colleagues who, after initial resistance, valued the wider perspective he brought to their discussions involving financial matters along with wider business issues. Participant story 4: An experienced Quality Assurance Business Partner was frustrated by the lack of take-up beyond the rhetoric of “quality matters” and the continuing lip-service paid to “quality is everyone’s concern”. By shifting their perspective to one of educator rather than judge or critic, they were able to enroll a greater number of colleagues into a genuine involvement in quality management and in doing so deepened the relationship with each colleague. So far in our answer to the question, What is Business Partnering?, we have taken the individual perspective of a Business Partner that may want to develop their own skill-set, but what if you’re CHRO or a VP responsible for the task of developing functions across a global or national business? Our advice is to work systemically. We often hear Business units complaining that functions operating in their own narrow agendas and do not “understand” the business. Similarly, over half of our Business Partners that we work with see getting a “seat at the table” as their biggest challenge when it comes to working in genuine partnership with the business. How do you maintain awareness of organisational strategic direction? i.e. goal alignment between the functional and the business agendas especially when explicit KPIs are different? To what extent do you share a collective responsibility with the function / with the business for the organisation and its results? i.e. (Re)connecting individuals to organisational vision and purpose, and aligning purpose and vision across the entire organisation enabling functions and front line business units. Much of what we have discussed here in our answer to the question, What is Business Partnering?, has been founded in the real life experience of 2,000+ Business Partners around the globe. We are continuing to talk to more and more Business Partners through our programmes and coaching to refine our understanding of how best to improve their impact in the complex business environments that we find ourselves. What is Business Partnering for you? If you are a Business Partner yourself, how does our description compare to your lived experience? What would you like to clarify or learn more about? What is your one key takeaway after reading this article? Are you a Business Partner feeling ‘stuck in the middle’? Here are five Business Partner skills that you can implement straight away! Want to find out more about Business Partnering? Would you like us to keep you up to date with new PDFs, insights and articles about developing leadership skills and subscribe me to your blog and newsletter? N.B. We adhere to all EU anti-SPAM and privacy legislation.